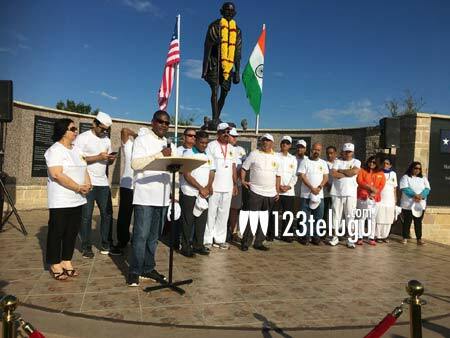 Dallas, TX:Mahatma Gandhi Memorial of North Texas (MGMNT) celebrated Gandhiji’s 148th birthday on October 1st at Mahatma Gandhi Memorial Plaza in Irving (Dallas), TX with hundreds of people participating in “Gandhi Peace Walk” led by IANT. It was a quite scenic event to watch as children, men and women wore white dress and white caps. Mr. Allen Meagher, Mayor ProTem, Irving City along with Mr. R.D. Joshi, Consul, Houston attended as Chief Guests of Honor. Mrs. ShabnamModgil, MGMNT Director in her opening remarks reminded everyone that United Nations declared October 2nd as International Day of Non-violence. Mr. Rao Kalvala, MGMNT Secretary welcomed the gathering and thanked City of Irving and the community for being hand in hand to build the Largest Gandhi Memorial in the USA. Mr. John Hammond, MGMNT Co-chair introduced the MGMNT Board to the community who work very hard all the time. Mr. Salman Farshori, MGMNT Co-chair kicked off the event and stated having Gandhi Peace Walk at Gandhi Memorial is a unique and many other communities may not have this kind of opportunity. Mr. Allen Meagher, Mayor ProTem told that as a special guest of honor, it gives him great privilege to participate in Gandhi Jayanthi Celebrations and appreciated the MGMNT Board for working closely with City and organizing all community related events. He assured City’s support for all the events. Mr. R.D. Joshi, Consul of India Houston in his key note address reiterated the greater need for peace and harmony especially at this present times. There is no other solution for solving any difficult situations except by dialogue and understanding each other the way Mahatma Gandhi showed to the whole world. Dr. Prasad Thotakura, MGMNT Chair stated that it is very important to have peace around the world and told that Gandhijifought the British for India’s independence without using any weapons but simply mobilizing masses with his simplicity, honesty & integrity therefore he was called as Peace Icon of the World. Dr. Thotakura also told the famous saying of Gandhi “Peace begins with a smile” which lights up a room and asked to imagine what the world of smiles can do. He asked the community to be compassionate and do something in kind to someone and it will create a ripple effect. MGMNT Board and Chief guests released about 12 white doves in symbol of spreading Peace across the globe. Hundreds of community members walked around the lake after warmup session by Yoga coordinator Mr. Vijay. All community members paid tribute to Gandhi by offering flowers. Later, breakfast was served to the attendees. IANT secretary B.N. thanked his team members and volunteers, media, Police Department and City of Irving Officials for making all the needed arrangements at the event. For more information on MGMNT activities, please visit www.mgmnt.org.